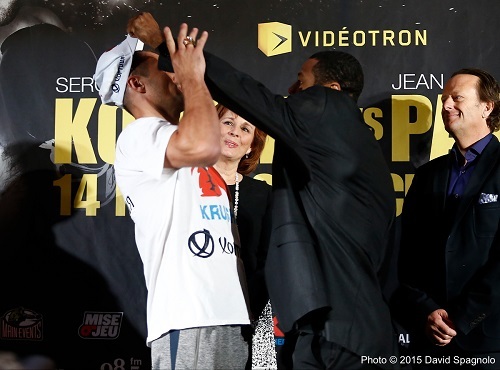 This weekend in the boxing hotbed of Montreal, Canada hometown hero Jean Pascal will try and make his comeback go full circle when he takes on the division’s most feared fighter in Sergey “Krusher” Kovalev. It’s the latest attempt by Kovalev to encircle the division’s true lineal champion, Adonis Stevenson, by defeating yet another of the weight class’s elite boxers. If he’s successful, it will be virtually impossible to justify Stevenson as the best fighter in the division, lineal champion or not. Very few fighters ever change their reputation in one fight the way Sergey Kovalev did when he defeated Bernard Hopkins last year. Going into the bout, Kovalev was regarded as a terrifying but technically a basic knockout artist. In fact, many top experts believed the forty-nine year old Hopkins had enough boxing acumen to upset the Russian puncher. Kovalev completely flipped conventional wisdom on its head by administering one of the finest displays of technically precise boxing in recent memory. Almost instantly, Kovalev has become viewed as a more complete “boxer-puncher”. Pascal has had a remarkable career resurgence considering that just four years ago he looked like the latest in a long line of talented young fighters to be neutered by the aforementioned Hopkins. Pascal’s win over the faded Lucian Bute may not have been a critically acclaimed performance, but it did ensure that he took sole possession as “king-pin” of Montreal’s lucrative boxing market. For Pascal, the fight with Kovalev is not only a chance to put the Hopkins embarrassment behind him, but would actually take his career to a higher level than it was before the two Hopkins bouts. How many other Hopkins victims have recovered to score a career best win? Just one. That was Glen Johnson, who seven-years (and eight losses) after being stopped by the “Executioner” in 1997 would defeat Antonio Tarver for the lineal 175-pound title in 2004. In boxing, it can be very easy to fall in love with conventional wisdom. Most people felt that Kovalev was a one-dimensional wrecking machine until he out-boxed Hopkins. In fact, his transition towards becoming a more complete boxer has come on gradually over his last several fights, at least according to the numbers. During his rise up the ranks, Kovalev was a freight train moving downhill and obliterating whatever was in front of him. According to compubox, Kovalev averaged an astonishing 81.6 punches per round against Darnell Boone, Lionel Thompson, Gabriel Campillo, Cornelius White and Nathan Cleverly. One of Kovalev’s greatest strengths as a fighter lies in his ability to quickly assess what’s in front of him. When he sees immediate weakness, as he did with the previously mentioned fighters, his killer instinct is tremendous and none of them lasted more than four rounds. Since Kovalev has been a champion, however, his tactics and pace seem to have changed. The knockouts have continued (except in the case of Hopkins) but the way he goes about it has changed. Against Ismayl Sillakh, Cedric Agnew and Blake Caparello his pace slowed dramatically, as he threw just 43.6 punches per round, which is below the division average of approximately 53 per round. Conversely, Kovalev’s defensive numbers have improved across the board. Hopkins managed to land just sixty-five total punches in twelve rounds against Kovalev. In the biggest victory of Pascal’s career against then champion Chad Dawson, his unpredictable and highly unorthodox style was on full display. It’s a style he patterned after his hero (and current trainer) Roy Jones Jr., and it caused the technically astute but often lackadaisical Dawson nightmares. In Pascal’s ensuing fights, however, we saw the faults of his mimicry. Jones was a fighter that would save energy by baiting fighters and setting traps for his highly unconventional but deadly counterpunches. In his last four fights, Pascal has made the sometimes-cautious Jones look like Henry Armstrong by throwing a cringe-worthily low 33.9 punches per round. Pascal, unlike Jones, is also very often times an arm puncher and as a result possesses just a 51% knockout ratio, as compared to Kovalev’s 85% knockout rate. Pascal’s punches are very flashy and if he can slow the pace they very often steal him rounds because they register on such a visual level. Against a more passive opponent like Dawson or Bute, this worked wonders, but against a murderous puncher with a spear of a jab like Kovalev, it could be disastrous. In the lead up to their second bout, Hopkins ridiculed Pascal for being a four-round fighter because of his notoriously poor stamina. Pascal’s tendency to throw wild punches has often left his gas tank on empty in the later rounds of big fights. Even in his two biggest victories against Dawson and Bute he showed intense vulnerability late in the fights. Against a fighter that starts as quickly as Kovalev (who has 21 KOs inside of four rounds), Pascal’s usual strategy of early aggression could be suicidal. In order to achieve victory, it will be incumbent upon Pascal to be more productive in the later rounds. Despite his victory over Hopkins, Kovalev has gone past seven rounds just once in his entire career. Pascal seems mentally up to the challenge. “I said the best scenario is to give the fans 12 good rounds and then try to knock him out in the last 15 seconds of the fight,” says the Haitain-born Canadian. That would certainly end any claims about Pascal’s lack of gas mileage. One of the more prevalent stylistic storylines going into the bout has been whether Kovalev can dent Pascal’s up to now iron chin (the Canadian has never even been knocked down) and what will happen if he cannot. Since Kovalev burst onto the boxing scene with a string of violent, hip thrusting knockout victories, there have always been quiet rumors floating under the surface about the Russian’s ability to take a punch. Kovalev has suffered just two knockdowns in his career, and one of those was a complete flash knockdown against Blake Caperello. So maybe it’s that all knockout artists have a question mark on their jaw until some one of equal measure takes aim at it? Or maybe its all those rumours that middleweight title-holder Gennady Golovkin put him over in a sparring session? While those claims lie completely within the realm of innuendo, Kovalev was knocked out in the unpaid ranks against amateur rival Abbos Attoev. Kovalev, to his credit, has taken very little return fire as a professional and a good trainer will always tell you that the best chin is the one that never gets hit. However, this is pro boxing, and at some point Kovalev’s jaw will get tested by a big shot. Pascal, on the other hand, is perceived to have an iron jaw by the vast majority of the media. He has never been down as a professional and stood toe-to-toe with the hard-punching Carl Froch in a twelve round war. Yet, could the claims of Pascal’s George Chuvalo-esque chin be slightly overblown? Pascal proved in the Froch bout that he could handle a big shot from a 168-pounder, but Pascal has yet to show that he can take a big shot from a legitimate light heavyweight. Both Hopkins and Dawson (who had Pascal badly hurt in the eleventh round) are not considered big punchers for the division. Conversely, Kovalev is arguably the division’s best puncher since Mathew Saad Mohamed. In other words, if Pascal believes that his best chance to win the fight is because he takes a superior punch, then he is doing his sincere best to justify the 4-1 odds in favor of the “Krusher”.